Registration: $299 | Registration is available only through the Connected Health Conference site. This workshop, hosted by Parks Associates as a pre-conference event at HIMSS’ Connected Health Conference, combines Parks Associates’ research presentations with expert panels to provide attendees with knowledge and guidance regarding new business opportunities in connected health. Analysts and industry executives discuss the role of health for the connected consumer and strategies to deliver healthcare innovations through a connected and intelligent home. 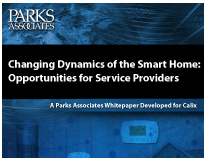 This presentation draws on Parks Associates’ smart home platform and digital health research to highlight crossover use cases with the most compelling value propositions for consumers and their healthcare providers. This panel invites guest speakers from the smart home industry and developers of connected health applications to discuss product and marketing strategies for launching connected health solutions. They share insights and approaches to driving greater integration and offering optimized user experiences. Jennifer Willey, Chief Business Officer, Independa, Inc. Connected sensors and wearables play a big role in aging-in-place solutions, and software capability, including front end UI and backend analytics engine, is equally important. This panel invites experts from the sensor, UI, and AI fields to discuss technology readiness, implementation strategies, and business models that support a smart independent living experience. This presentation features Parks Associates’ caregiver survey data and technology research to highlight innovators and early successes in this under-invested market. It also analyzes where opportunities emerging over the next 3-5 years as consumer demand increases. As healthcare delivery shifts from high-cost institutional care to lower-cost home care, the concept of home as a care setting expands significantly from the current nurse home visit model to a variety of new services. Among them, the opportunity to help consumers manage their chronic conditions has the most potential, provided these services are delivered properly. This expert panel focuses on consumers with chronic conditions and invites guest speakers to discuss means and strategies to deliver preventive services and care coaching services to the home. Poor sleep quality detracts from people’s quality of life and contributes to chronic health problems. However, it is difficult to communicate the health benefits of sleep to consumers, even with today’s sleep tracking technologies. This panel invites sleep technology vendors and sleep experts to discuss how sleep tech can be integrated in a smart home experience. They also discuss strategies to engage consumers with smart sleep technologies and the concept of the smart bedroom. Bryan Adams, Chief Commercial Officer, GreatCall Inc.
Bryan Adams is the Chief Commercial Officer of GreatCall, Inc., the leader in connected health for active aging. Bryan joined the company in December of 2016 as a part of the Healthsense acquisition. Bryan leads a cross-functional team that addresses two related areas. The first is the company's broad data science initiative: leveraging the company's sizable data set to improve the experience for both internal and external customers. The second is the commercial product: ensuring that the GreatCall offering in the healthcare space both leverages the company's data science department and meets the broader needs of the market. Prior to GreatCall, Bryan was the CTO at Healthsense for almost five years, where he led the engineering, IT, product management, customer service, and clinical service teams. Prior to that, he was the CTO and founder of a startup in the mobile advertising space, and prior to that he was a Principal Investigator at iRobot, helping them start a healthcare group. He holds a BS, MEng, and PhD in Computer Science from the Massachusetts Institute of Technology. As the chief strategy officer at Reflexion Health, Martin Alder oversees product development, market innovation, and user experience. His passions include leveraging healthcare technology and academic research to empower people to lead longer and healthier lives. Prior to joining Reflexion Health, Martin co-founded Healthrageous, an innovative digital wellness company that was later acquired by Humana. Healthrageous was a pioneer in combining wireless biometric sensors, real-time coaching, and social networking to help people take control of their health and wellness. Martin also co-founded Trained Genius, a cognitive enhancement company that incorporated neurofeedback and virtual reality to improve patients’ concentration, memory, and mental acuity. He holds patents in automated coaching systems and educating in virtual environments. Martin is a national speaker who specializes in innovative healthcare technology, behavior change, and financial reform. He earned his bachelor’s degree in business administration from Franklin & Marshall College. Melissa Barra, SLEEP NUMBER® setting 30, serves as the Senior Vice President, Chief Strategy and Customer Relationship Officer. Ms. Barra was Vice President, Consumer Insights and Strategy from February 2013 to January 2015. Prior to joining Sleep Number in February 2013, Ms. Barra was Vice President, Process Reengineering Officer for Best Buy Co., Inc. from 2011 to 2012. In a dual role, she also served as Vice President, Finance, New Business Customer Solutions Group from 2010 to 2012. From 2005 to 2010, she held leadership positions in Strategic Alliances and Corporate Development for Best Buy. Prior to Best Buy, Ms. Barra held corporate finance and strategy leadership roles in companies in the US and internationally, including Grupo Futuro S.A., Citibank, and GE Capital. John Bojanowski is the President of Honeywell Life Care Solutions, a global leader in health management technologies and remote patient monitoring. Before joining Honeywell Life Care Solutions, Mr. Bojanowski served as the President and CEO of Motus Medical, Executive-in-Residence of MedPanel LLC, President of NiTi Surgical Solutions, and also provided senior management level consulting services for various medical device companies. Mr. Bojanowski earned his degree from Virginia Tech. John Carpenter is the Vice President of Sales and Channel Engagement for Health and Wellness for Nortek. He previously served as the Chief Marketing Officer for Numera before their acquisition by Nortek. Prior to that, John spent 17 years at Microsoft. John Joined Microsoft in 1995 as the Worldwide Healthcare Industry Manager where he was responsible for starting Microsoft’s Healthcare vertical. He held several other positions at Microsoft including Southeast District Business and Marketing Officer, Director of East Region Marketing and Sr Director of National Marketing Excellence. John studied Computer Science at North Carolina State University. He currently resides in outside of Charlotte, NC. Amy Cook serves as Director of Connected Devices for ResMed, which has a world-leading 5 million cloud-connected devices for remote patient monitoring. Since joining ResMed in 2012, Amy has been integral in helping develop and roll out its suite of connected health solutions that have helped increase patient therapy adherence, improve healthcare efficiencies, and transform ResMed into a software-driven medical device leader. Amy has 15+ years' experience as a product leader in medical device and SaaS businesses, and is passionate about leveraging data-driven insights to deliver better health outcomes and care. She graduated with a BS in optics and an MBA in marketing from the University of Rochester. Jody is founder and Senior Managing Partner of Longevity Venture Advisors LLC, where he works with innovative entrepreneurs, venture investors, public companies, and non-profit organizations to successfully leverage business and investment opportunities in the $7.6 trillion Longevity Economy. He is a recognized expert and thought leader on innovation, and products and services of relevance to the aging population, and the opportunities and challenges presented by the demographic wave. In honor of his contributions, he was recently recognized as a Top 50 Influencer in Aging by Next Avenue/NPR. He has over three decades of experience helping companies grow by developing and implementing competitive strategies and achieving their strategic market goals. Jody was previously AARP’s Senior Vice President of Market Innovation where he conceived and built the first program to spark innovation in the market that benefits people over 50. In this role, he envisioned and developed the concept and market category of the $7.6 trillion Longevity Economy; Designed and helped execute AARP’s venture capital strategy as a member of the Investment Committee; Created and built the Health Innovation@50+ LivePitch franchise which attracted over 1,000 startup applicants resulting in 35 finalists which raised over $200 million in venture investment; Envisioned and launched the Longevity Network www.longevitynetwork.org with United Healthcare, a destination for entrepreneurs, investors, and industry; Produced the first market reports and revenue forecasts in digital health, caregiving, and FinTech of relevance to older people; and, Built the health-focused research consortium, Project Catalyst, including United Healthcare, Pfizer, Medstar Health and Robert Wood Johnson. Prior to creating the Market Innovation initiative, Jody was SVP of AARP’s Research and Strategic Analysis department, and created AARP’s first competitive intelligence group. Jody holds a graduate degree from the University of Chicago. He is a Managing Director of Match Point Partners, a healthcare advisory firm and investment bank, and is on the Strategic Advisory Board of HLM Venture Partners. His work has been published in Venture Capital Review, American Banker, Journal of Business Strategy, Competitive Intelligence Magazine, Competitive Intelligence Anthology, and Making Cents Out of Knowledge Management. His thought leadership and achievements have been recognized in Bloomberg Businessweek, CNBC, Financial Times, Forbes, Fortune, Marketplace, Information Week, NY Times, PBS News Hour, VentureBeat, and other media. Jeff Patton leads the vision and strategy for GE Lighting’s connected home business, and setting the course for the next 100 years of GE Lighting innovation. Jeff is involved in smart product development, partner ecosystem collaboration and oversight of GE Lighting’s connected incubation lab. He has been part of the team charged with launching GE Lighting’s first connected products and overall connected strategy. Prior to this role, Jeff developed new ideas and ways of working as GE Lighting’s GM Growth and Innovation – FastWorks where he was charged with changing the way GE innovates. He previously served as GE Lighting’s Director of Consumer Marketing. Jeff brings extensive experience in marketing and management for consumer channels, including General Mills, AOL, Dyson, and Groupe SEB, as well as experience in commercial channels with scientific instruments, holding leadership and engineering positions at HP/Agilent. Jeff has a Bachelor's Degree in Electrical Engineering from Cornell University and an MBA from the Kellogg School of Management at Northwestern University. Perdomo joined Mivatek as Senior Vice President of Corporate Strategy & Development, with over 19 years’ experience in the security & wireless industries. Before joining MivaTek, Perdomo was the Lead Business & Market Development for Digital Life International at AT&T. Prior to that he was Senior Strategic Product Marketing Manager for Worldwide Peripheral Products at ADT Security Services, Division of Tyco International. He also served as Vice President of Business Development for Generation One, Inc., a remote manage disease & healthcare solution. Perdomo, holds 62 issued and pending patent applications. He also holds Six-Sigma and Digital Six-Sigma certifications. He served on the University Advisory Council Boards for the University of Florida and Florida International University. He received his MBA with a specialization in International Business from the University of Miami and his B.S. in Electrical & Computer Engineering (BSEE) from the University of Florida. Roy Raymann, PhD is Vice President, Sleep Science and Scientific Affairs at SleepScore Labs. As a leading researcher in the field of sleep science, Dr. Raymann spent more than a decade in academia studying sleep at the Netherlands Institute for Neurosciences, before joining the private sector. He was most recently at Apple where he was responsible for the company’s efforts in health-related initiatives, which included features such as Night Shift, Bedtime and the Sleep part of Apple Health. Prior to Apple, he was the Sleep Thought Leader at Philips Research focusing on the consumer sleep division where he founded the Sleep Experience Lab. Dr. Raymann holds a PhD in Life Sciences from Vrije University Amsterdam and was recognized in the Netherlands with an award of Best PhD Thesis in Sleep Medicine. His research and post-doctoral work spans more than 25 years and encompasses multiple publications in peer-reviewed journals, book chapters, speaking events and patents. In addition, Dr. Raymann serves as an ad hoc reviewer for several sleep journals, including SLEEP and Journal of Sleep Research and was editor of the Dutch Sleep Annuals. At SleepScore Labs he is heading the collaborations with industry, academia and clinics, and oversees of the scientific rigor of the SleepScore ecosystem. Nathan Treloar has served in executive leadership roles in several successful high growth software companies. At Orbita, he's helped create and bring to market healthcare’s first enterprise-grade voice experience management platform for creating solutions that use AI and voice assistants (ie; Amazon Alexa, Google Assistant,) chatbots, and other conversational environments to improve remote patient monitoring, care coordination, education, clinical trials, research and business operations. Previously, Nathan held key executive positions at FAST Search, Microsoft, RAMP, and, Ektron. He is a respected expert and speaker on consumer IoT trends, search, text and data mining, content management, and knowledge management and has advised hundreds of the world’s largest companies and government agencies on their applications. John Valiton is CEO of Reemo Health, a senior health technology solution designed to empower caregivers with actionable insights to improve the aging experience. As a 20-year business development veteran and entrepreneur, Valiton has developed partnerships with many national and international companies. He has been an avid technology enthusiast since an early age, and applied his interest in all things tech at the intersection of IoT, wearable technology, healthcare and data science through his position as a strategic advisor, chief revenue officer and now chief executive officer for Reemo. Anthony Versarge leads health and wellness product management for Comcast where his work focuses on innovative ways to extend healthcare into the home in a frictionless fashion. In his role, Anthony sets the vision, strategy and leads execution of emerging healthcare offerings at Comcast. He has extensive experience in patient engagement, telemedicine and remote patient monitoring. Prior to Comcast, Anthony was a consulting executive at Accenture where he deployed some of the first mobile healthcare applications. Anthony holds an MBA from Duke University and receive a Bachelor of Science degree in Computer Science and Economics from the University of Wisconsin-Madison. Jennifer Willey brings more than 20 years of experience at the intersection of technology and healthcare--building innovative, strategic partnerships and solutions across digital media, marketing, content and programs. As Chief Business Officer at Independa--an interactive, ‘smart’ TV platform providing connected care for older adults, their caregivers and the organizations helping them “thrive in place--” she is responsible for commercial and consumer growth. Willey most recently served as Vice President of Consumer Strategy and Partnerships for WebMD. She has a proven track record of fostering innovation, driving growth, and building long-term strategic relationships in a variety of roles for companies like Yahoo, AOL/Huffington Post, Sharecare, RealAge, Everyday Health and TV Guide. Prior to her pioneering work in health within the digital media industry, Willey was a Management Consultant for PricewaterhouseCoopers. Willey started her career as a TV News Anchor and Reporter at CBS and ABC affiliates in South Carolina and New York. Willey has served on the Boards of the Consumer Health Products Association and the NY Chapter of the Alliance for Women in Media. She is the founder of numerous women’s business empowerment networks, an advisor and mentor to CSweetener (an executive mentoring platform for women) and has been a presenter and panelist at a number of industry conferences and the University of Pennsylvania’s Wharton School. Willey is a graduate of Cornell University’s School of Agriculture and Life Sciences, and lives in New Jersey with her husband and two sons.